The winner of the 2015 Padoh Mahn Sha Young Leader Award, is Sa Shine, a youth educator from the Hpa-an Youth Network. Sa Shine was presented with the award at the 66th commemoration ceremony of the Karen Martyrs’ Day held at the Karen National Liberation Army’s 7th brigade headquarter on August 12, 2016. Saw Say Say Phan, one of the founders of Phan Foundation and the elder son of Padoh Mahn Sha Lah Phan, spoke to Karen News on why Sa Shine was chosen as the winner for this year. 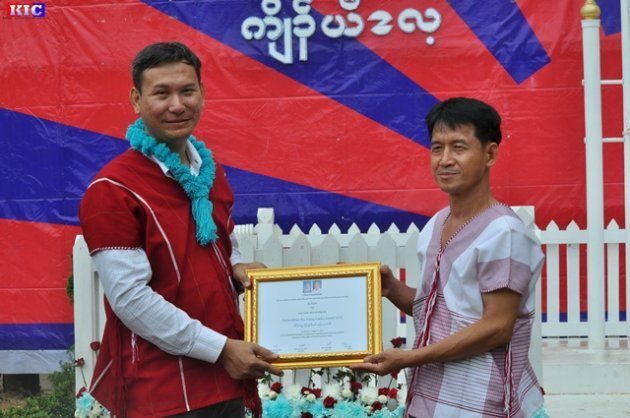 The winner, Sa Shine was recognized for his work on education issues, including at refugee camps on the Thai Burma border and for other Karen organizations, the Thabyae foundation in Burma, the Hpa-an Youth Network and the Taunglaya Education Center. Sa Shine told Karen News that the words of Padoh Mahn Sha Lah Phan were his motivation. The statement said that as a result of Sa Shine’s hard work, many young Karen people now have access to further education and employment opportunities, for example, 12 students received a scholarship to study in universities and schools. Some of them are now running social development programs in their respective fields and are contributing to their communities. Sa Shine, cited in the Phan Foundation statement said. The Phan Foundation explained that “Padoh Mahn Sha Lah Phan was assassinated by agents of the Burma military dictatorship on 14 February 2008. In memory of Padoh Mahn Sha and his wife, Nant Kyin Shwe, their four children established the Phan Foundation with the aim to support the Karen people through poverty alleviation, education and human rights and culture preservation.